Family: Younger brother, Neil, is a member of the AIS basketball team. Both of his parents are British and his father, Brian, played soccer for Wimbledon FC. Injuries: In 1999 he suffered a stress fracture in his right knee (Dec) and received five stitches in his foot (Nov) following an accident putting the washing out at home. Training Partners: One of his training partners is "Moss" his pet dog a Flat Coated Retriever. Hobbies: His interests include soccer, movies and coffee. Other: Craig is a former Australian junior triathlon champion and was a member of the Victorian triathlon team in 1997 & 1998. 3000m (indoors) 7:48.34 2001 LOCATION? In his teens, Craig was an Australian junior triathlon, but in late 1998, due to his studies at Geelong Grammar, he found he didn't have time to train for the three disciplines and decide to link up with local running coach Bruce Scriven. Within months he had become the fastest Australian junior 3000m runner when in February 1999, her broke the National U20 record with a time of 8:02.77. The next month he placed 18th in the World Junior Cross Country Championships and closed the season with a second placing in the National U20 1500m. He performed well in a top class 5000m State League race in late 1999. Craig celebrated his 20th birthday by setting an Olympic A Qualifier and PB (13:26.20) for the 5000m in Manchester in June 2000 and backed up with a 1500m PB in Zagreb in early July. 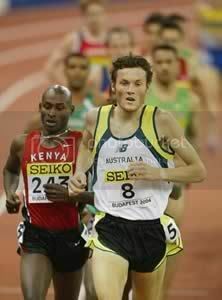 Craig contested a heated 1500m with Nick Howarth at the Telstra Olympic Trials resulting in Howarth being disqualified. 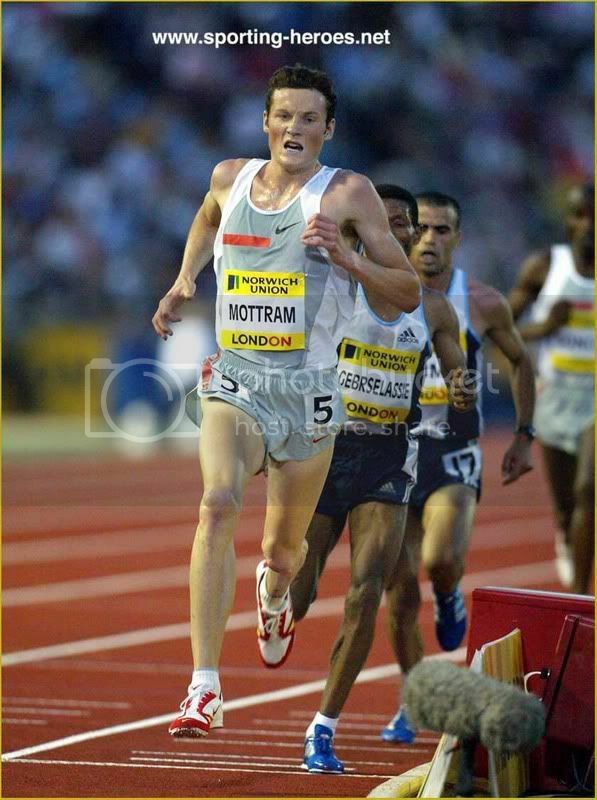 A re-run of the trial event was conducted one week later with Mottram finishing 10th in 3:54.50. 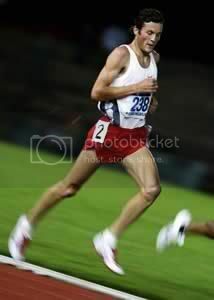 Following Shaun Creighton's decision to concentrate on the 10000m, Craig was selected to represent Australia in the 5000m at the 2000 Olympics where he finished 8th in his heat. He compiled a spectacular series of performances in the summer of 2001. The summer started with a 3000m PB (7:50.34) at the Telstra Athletics Grand Prix in Newcastle. On February 16 he broke Shaun Creighton's Australian 3000m record in a time of 7:41.35. He was just beaten by 3:47 miler, William Chirchir in the John Landy mile at the Melbourne Track Classic, clocking 3:54.65 to move to No. 5 in Australian history in his first ever mile race. A week later he won his heat of the 3000m at the World Indoors in Lisbon. In the final he placed 8th, lowering the Australian record for the second time in three days. On March 24, Craig placed an outstanding 8th in the short course (4km) at the World Cross-Country Championships. 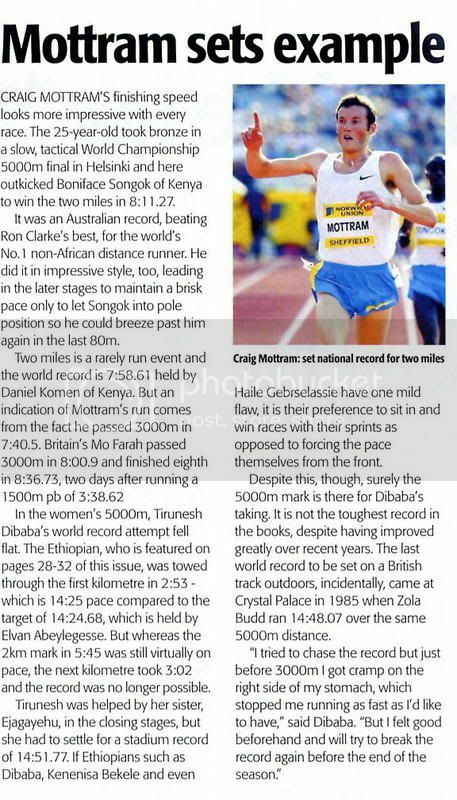 Craig prepared well for the 2001 World Championships running a 3:53.06 mile and 13:23.94 5000m during June. Due to his tremendous 1500m/mile form, it was decided to switch Craig from the 5000m to the 1500m for the World Championships, where he made the semi finals after a tremendous 3:39.10 in the heats. Craig placed 6th in the Goodwill Games mile and 6th in the 1500m at the IAAF Grand Prix Final in Melbourne, in an awesome 3:35.40, moving him to No 5 in Australian history. In December 2001, Craig made his 10,000m debut, taking the Zatopek race in a Commonwealth Games B qualifying time of 28:19.26. 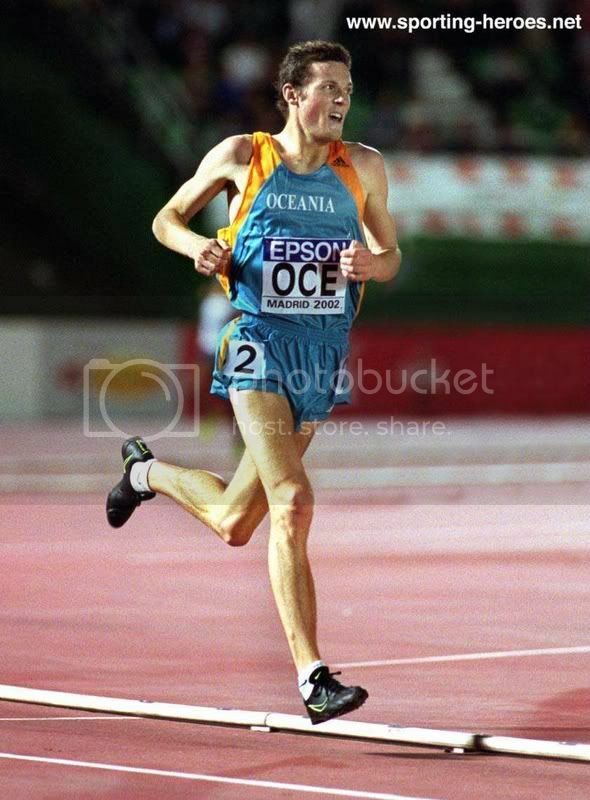 On March 7th before he left for the 2002 World Cross Country Championships, he removed 11 seconds from his 5000m best to take the Australian record from Lee Troop. At the World Cross Country Championships in Dublin, Craig placed an outstanding 5th - the 2nd best ever result by an Australian. Selected in the 5000m for the Commonwealth Games, his 6th National team in just 18 months. Ran well in the lead up to the Commonwealth Games running a mile pb and an Australian 3000m record. At the games placed 6th in the 5000m. Competing at the 9th IAAF World Cup in Madrid, Craig dominated the 3000m to set a new World Cup Record (7:41.37) and won by over six seconds. Craig did not compete domestically in 2003, suffering from an ITB problem. Started to resume competition in mid-2003 with sensational results. Clocked an Athens Olympic A qualifier over 5000m on September 10 with a time of 13:17.81, then won Zatopek in December clocking an Olympic B in the his second ever race a the distance. Craig was 9th, and first non-African in the Senior men's 4km race at the World Cross Country in Brussels. On Thursday (6th May) night's Men's mile race, which was held at the meeting staged to celebrate the 50th anniversary of Bannister's ground-breaking first sub-four minute mile, Craig Mottram, the tall Australian aiming for the 5,000 metres at the Olympic Games in Athens, was an easy winner in a track record of 3:56.64 on the same Iffley Road track in Oxford - now a modern all-weather surface compared to the cinders in 1954. Mottram, who will be based in London for the summer, said: "This was a great way to start my season, beating the British in such a historic meeting. It was also good to do this in front of John Landy, who helps us a lot when we're training down in Melbourne." 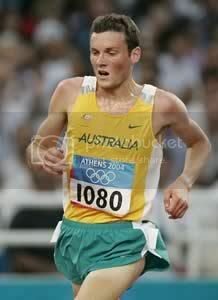 Craig Mottram became the first Australian distance runner to break 13 minutes for 5000m. Not only that, but he posed an enormous threat to Ethiopian distance legend Halie Gebrselassie, who eventually won in a sprint finish, charging to a UK allcomers’ record of 12:55.51 as he prepares to bid to become the first man ever to win three Olympic 10,000m titles. The last lap had been covered in 55.67 seconds. For Mottram in second place, there was the considerable consolation of clocking 12:55.76 at the end of a summer in which he has obviously trained well in the suburbs of London. Haile Gebrselassie: "Wow, that was really, really hard, but I ran really well. I am so happy today. The crowd, as always, were fantastic, I am really pleased I won for them. I was really surprised when Craig came past me. He was like a whippet. He really pushed me along and helped us run a very fast time." Craig Mottram of his Australian record 12:55.76: "That's brilliant! I came here to run 13 minutes; I have gone better. I am now four weeks away from the Olympics. I am ready to go and I can get a medal. I have a 1500m in Zurich next week to sharpen up and rectify my personal best over the shorter distance and then in the last 200m I will be able to hold them off. With 500m to go tonight, I thought I could win the race, so I took off and even Haile struggled to get past me." Australia's Craig Mottram took the two miles with a dominant display in 8mins 11.28secs, a new national record.